ITW Construction Products is a leading manufacturer of fixing, fastening and drilling systems for wood, steel and concrete applications. Through a number of brands the Construction Products division of the global organisation ITW Inc. offers the construction industry a wide range of products, primarily aimed at professional users, such as electricians, carpenters and dry liners. 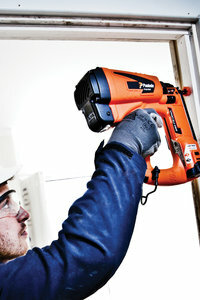 Paslode are internationally renowned as innovators and leaders in the manufacturing of cordless and pneumatic nailing systems for timber construction and industrial applications. In 1986 Paslode launched a tool in the UK which revolutionised the way in which many building trades work on site. Operating through a linear combustion engine, Paslode Impulse gas nailing products were cordless and users could move freely around construction sites without being restricted by the hoses and compressors required by pneumatic tools. Now, over twenty five years later, the Paslode Impulse range has developed to offer solutions for both first and second timber to timber applications enabling users to work more effectively for longer periods of time. For over 50 years Spit have been a leading supplier of steel & concrete nailing, and metal & chemical anchoring systems to the UK construction industry. In 1949 the two founders invented a unique system for firing hardened steel nails into concrete and steel (now generally known as Cartridge Tools or Powder Actuated Tools: PAT). Since then, Spit have developed further technologies for drilling, fixing and anchoring in the construction industry which are all prevalent in today’s market.